Baton Rouge is a great place for a family vacation. 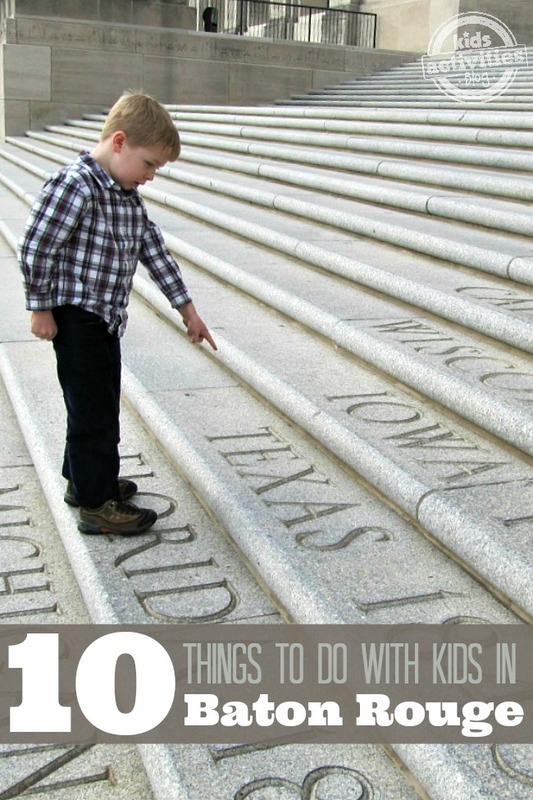 There is great food, historic sites and museums to visit, water parks, and lots of fun activities for all ages. 1. Tour the Historic Magnolia Mound Plantation – Discover the history and architectural beauty of a real Southern plantation. Kids can learn about life in the early 1800’s and how chores and cooking were so different back then. 2. Step aboard the USS Kidd Veterans Memorial – The USS Kidd was a WWII Destroyer that was built in 1943. It now serves as a Veterans Memorial Museum docked on the Mississippi River. You can enjoy a self guided tour, see aircraft from the era, or even spend the night on board this historic ship. 3. Roll down the Indian Mounds – Two 20 foot mounds stand side by side on the LSU campus. They are believed to be ceremonial mounds dating back 5,000 years! Kids love to run up and down the mounds, roll down the sides of them, or just enjoy the view from the top. 4. Play at Blue Bayou Waterpark and Dixie Landin’ Amusement Park – Blue Bayou Water Park has over 20 water attractions including the Mambo which is the world’s largest upside down water slide! But it isn’t all just nail biting scary rides. There is an awesome wave pool and younger kids will love the lazy river and Pirate’s Cove. 5. Discover the Bluebonnet Swamp Nature Center – Follow the boardwalks and paths through the varied habitats of swampland, hardwood forests, and beech-magnolias and view the amazing birds and wildlife that live there. You can visit the 9500 square foot Nature Center and see displays, carvings, photographs, and live animal exhibits. 6. Step back in time at the Old Arsenal Museum – This incredible museum was once an military post built back in 1838. In later years it served as a post in the Civil War during the Battle of Baton Rouge. It is now an historic site and museum for all to enjoy. Just outside the museum, kids will enjoy the old cannons and ringing the reproduction of the Liberty Bell. 7. Visit the Enchanted Mansion Doll Museum – Your little doll lover will enjoy spending time at this delightful museum full of antique dolls to contemporary dolls. There is even a life size Victorian doll house for kids to walk through! 8. Enjoy the great outdoors at the Hilltop Arboretum – Kids love walking along the paths and enjoying the great outdoors as they stroll through 14 acres of native trees, shrubs, and flowers. My kids especially love looking over the side of the old bridge. 9. Star gaze at the Highland Road Park Observatory – Kids and adults will be amazed as they look up at the stars through this 20 inch reflecting telescope. Saturdays are a great night for the public to go out and experience hands on demonstrations of how the telescope works and get help located stars and planets in the night sky. 10. Visit the Louisiana State Capitol Building – Kids love to roll down the hills outside the state capitol building. However, climbing the massive stairs to get to the entrance doors is not only fun but also educational because each step is inscribed with a state’s name and its date of admission to the union. But the most fun about a visit to this amazing building is the observation deck on the 27th floor. Kids love to look down at the people on the ground that look like little ants 350 feet below them. Your family may also enjoy visiting the Baton Rouge Zoo or stopping by to say “Hi” to the LSU mascot, Mike the Tiger, in his big habitat on the campus. There are so many great family friendly activities in Baton Rouge that I’m sure you and your family will have a great time on your visit. What about Rural Life Museum/Burden Center & Botanical Gardens? These are hidden gems and so proud we have them in our city!